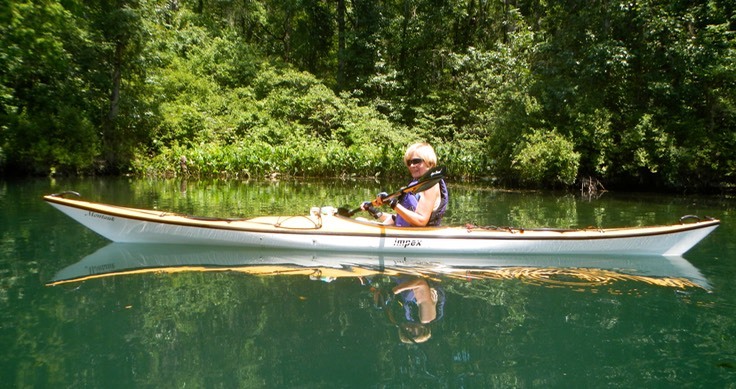 Lisa paddling the Wakulla River on a very hot day. Lisa and I did not drive six and a half hours to Tallahassee just to paddle the Wakulla River. In fact, Tallahassee was just a waypoint on our trip to Panama City Beach and my volunteer job of certifying park rangers as short distance, flat water kayak trip leaders. We chose Tallahassee as our waypoint because it’s our state capital and we had never been there. We managed to visit the capital buildings and watch the House in session, as well as visiting the old capital museum. I must admit, Tallahassee was a surprise. It is a lovely, gracious, uncluttered city with much to offer. While there, we had lunch with Liz Sparks, Paddling Trails Coordinator for the Office of Greenways and Trails. Liz created and coordinates the volunteer program I work under. In the course of our conversations, Liz told us about the nearby Wakulla Springs State Park and the Wakulla River. After visiting the spring, Lisa and I decided we would return to Tallahassee on our way home to paddle the Wakulla River. The River runs nine or ten miles from the spring to the Gulf of Mexico. The put-in for our trip was some three miles up from the Gulf at a public boat launch on Route 98 at the foot of a bridge, next to the TNT Canoe Rental. Of the remaining six miles, only three can be paddled, as the state has erected a barrier at the CR 61 bridge to keep boats out of the spring run where they might disturb manatees. The put-in was pretty basic, having a dirt ramp, unregulated parking and an oversized handicapped accessible port-a-john in serious need of attention and repair. We arrived about 1:30 pm. It was HOT, really HOT! I unloaded the boats from the trailer and got them ready at the shore while Lisa set up chairs under the bridge where, while swatting bugs, we consumed a marginal lunch. Once on the water we felt better, but it was still hot. We tried to find shade along the river’s edge to no avail. The sun was pretty much directly overhead and the trees did not overhang the river to any degree. The air was very still. Lisa and I talked quietly as we paddled up stream. After a while a flotilla of inflatables, towed by a small powerboat passed by, having given up on their float trip in the slack current. Later, a small Armada of kayakers paddled by us going downstream as we paddled up. The water was clear and got clearer as we paddled toward the spring. 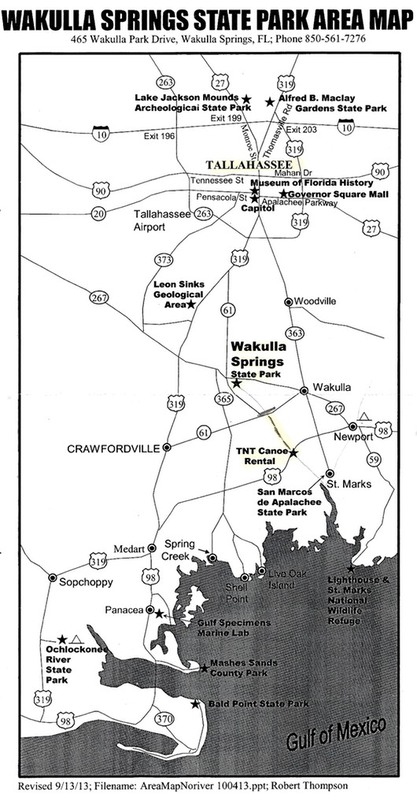 Wakulla Spring is the worlds largest and deepest fresh water spring. The area has been inhabited for over fifteen thousand years. As you paddle these waters it is interesting to think about the hundreds of generations of people who have inhabited this area. Initially, we saw no wildlife. It was to dam hot for them to be out and about! But after awhile we spotted a magnificent great egret, a tricolor heron and some ibis, Turtles began to appear on stumps and downed trees, fish could be seen swimming in the clear water, a gator appeared and slowly swam away up a slough. And best of all was the pair of river otters we spotted playing near shore. All in all, it was a good if very warm paddle. But we were glad to get back to the put-in, load our boats and turn on the air conditioning. Next stop; our hotel and a shower! The short video below will give some idea of what this paddle was like.